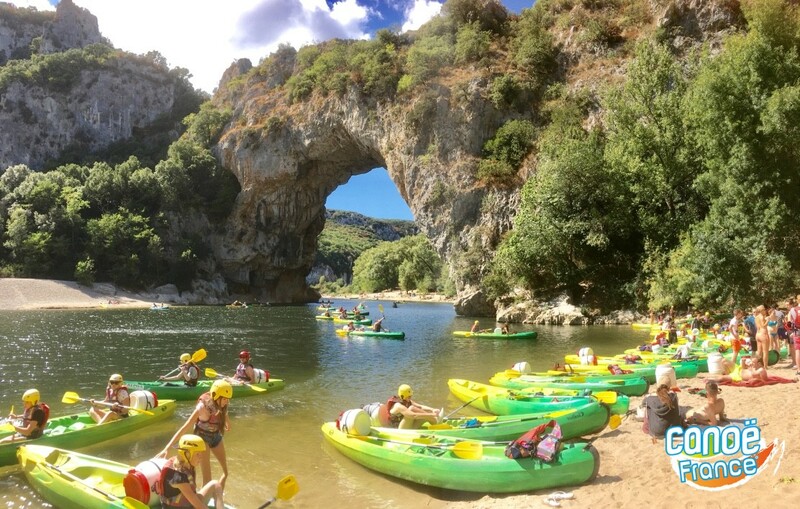 If you know how to swim, you will have no difficulty going down the Ardèche Gorges in the summer. Those with a taste for adventure prefer to come in the spring when the water is faster flowing. But you can also take your time. Numerous beaches along the stretch. Swimming, fishing, climbing. Discover the countryside and away from it all, naturism. We put all our skills at your service along with the warmth and hospitality of the local people. We come from here. We know and love the river and the countryside. Our aim ? That you appreciate them too. Our worry ? Your comfort. Which is why we have showers and toilets near the landing stage. Our creed ? To make your stay a pleasant, worry free and good humoured one. Cars and motorbikes are left in a closed, private carpark. We drive you by bus, minibus or four wheel drive vehicles. We have more than 100 boats (single and doubles canoes, single and double kayaks, mini-kayaks). The most up-to-date equipment, “fun” life jackets, waterproof containers and even wetsuits for athletic spring descents. To be able to swim 25 meters, to be more than 7 years old, to be in a good physical health, to wear closed shoes, to wear the buoyancy aids during the trip. Bring with you a dry top/shirt and wear tennis type shoes. Always take a supply of drinking water with your picnic. Protect yourself from the sun. (Wear a sunscreen, hat and sunglasses). For after canoeing bring a sweater and Kagool type jacket. Canoeing is accessible to all persons who are able to swim and are physically able. Respect the fauna and flora. Respect other users and stay away from the fishermen. For accomodation we recommend you “Hotel Restaurant Clos des Bruyeres”.